The 50iest Anniversary Pull in Bowling Green, Ohio. By far the most exciting and spectacular Pull. Tractor Pulling was grown in Bowling Green 50 years ago, and today „PullTownUSA“ is the Mekka of Tractor Pulling, and the place you have to be. - 5 days of pulling competition from Thursday to Sunday. 2 Power-Tracks with side by side pulling action. - All the NTPA classes were running two sessions. Pulling on daylight and in the evening under the lights. - For the 50iest event, all the american teams were there and pulled for the high price-money and the famous Bowling Green ring. - Also the Netherlands „BobCat“ team arround Berry and Bertus Boer toured the USA and were very succesful in PullTownUSA. - The Finals on Super Sunday, where the top 5 Tractors of each class competed again. - „The Legends“: Famous Pulling Tractors from the 70`s and 80`s were also pulling on the track on Sunday. Ofcourse we filmed all the action right on the track from different camera positions, also with onboard cams, in High Definition quality and full sound…. Spectacular engine explosion of „Young Blood“ Allis Chalmers ……..with close up film oft he destroyed engine…..
debutes his new John Deere „The Gambler“. Driver Brian Diekman takes a wild ride on this new machine. Jordan Lustiks Agco Silver Bullet and Deutz Silver Bullet reloaded. Over 50 Tractors in this Diesel Class. Pulling against each other on wheelstanding action………..
High performance diesel power. Great looking trucks create about 5000 diesel horses and put on a great show. The best looking Truck „Jacked Up“ splitted the engine block in full speed and throughed out the top half of the engine right infront of our camera. This was the worst engine explosion we ever captured on film. After that accident Jack Kielmeiers mechanic gave us an interview with close up footage of the terribly destroyed truck…..
For the 50st Anniversary event „The Legends“ Pulling Tractors from the 70`s and 80`s are brought back on the track and pulling again. Their owners restored and rebuilt those legendary machines and hooked them again to the sled. Mike Ott restored the first 4 engine powered modified, using a crossbox to bring the power to the rear axle……. The first tractor powered by a radial aircraft engine, built in 1969. Shown also with original footage from `69…. Larry McVey`s turbocharged and supercharged, hemi-powered modified was famous for his unique look…. One of the first turbine powered Mod. Super Stocks from the 70`s running a two-staged turbo setup and intercooler. After „The Legends“ pulling, the top 5 of each division were competing again and go for winning the „Bowling Green Ring“. Exciting how Berry Boer and „BobCat Jr“ finished the class. 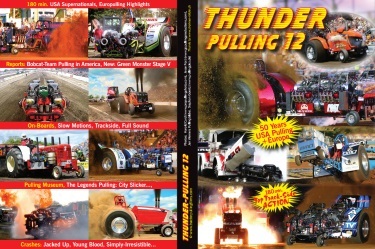 Part 2 of „Thunder Pulling 12“ reports about the european Pulling Scene. Füchtorf Germany: All the big names of Euro-Pulling were there. The new built „Green Monster Stage V“ was the first time hooked to the sled. It is the only tractor in the Light Mod. Divison, powered by 2 Allisons V-12. We show you this exciting machine with close up footage adn interviews of teamleader Tobias Hoerstkamp and mechanic Dirk Wessel. „Simply Irresistible`s“ rollover and huge engine fire. It happened directly in front of the camera. This was one of the most horrific and fireing crashes on european tracks. KRUMBACH Germany, KNUTWIL Switzerland with Nightpulling, KLOPEINERSEE and RAPPOLZ Austria. At all those events a lot of top tractors from Italy up to Holland were invited and pulling. „HURRICANE“ europes strongest Fendt SS……..
THUNDER PULLING 12 shows a lot of new, spectacular and exciting things from the wonderful world of Tractor Pulling. Don`t miss this one of a kind documentary, filmed in professional quality. Also available in High Definition. Price is Euro 19,90 (DVD) or Euro 29,90 (Bluray) plus Euro 5,00 postage - THANK`S.